I love me some Alpha Flight! I got hooked reading the John Byrne back issues in the late 1980s. I’ve stuck with the team ever since. Sadly they were wiped out in early 2006 in New Avengers (vol. I) #16. In 2007 we did get a solid Omega Flight mini-series, but it didn’t spawn anything further. Tom Brevoort: Scratchy, Alpha Flight is dead. Dead, dead, dead. I killed them. (Well, Bendis and I.) They are demised, dead, finished, decomposing, dead. They’re hanging out with Nightcrawler. However, if you happen to live in Canada (or are just visiting during the right weekend), the members of Alpha Flight are taking over for the Avengers, at least for one special variant cover to “Avengers” #4 illustrated by Phil Jimenez. This special extremely limited edition will only be available for purchase at the Fan Expo in Canada on August 28 and 29. And wait’ll you read the cover copy! Here is the amazing variant cover by Phil Jimenez! This thing is so gorgeous, I’m using it as my desktop wallpaper at work right now! Click the image to enlarge. My thanks to Dan of It’s a Dan’s World for directing me to this. If you’re not already reading Dan’s blog, you really should. Great source for comics information! I really liked Alpha Flight v.2, with all the mysteries and conspiracies. I was very disappointed to see them relegated to grist for the editorial mill, and then bringing in USAgent to try and revive them. Wasn’t there an Alpha Flight miniseries before they were wiped out that made them all time-displaced or something as well? I own a retarded number of Alpha Flight issues, and I’ve enjoyed many of them. However, I just don’t think that the team is cool enough to warrant its own ongoing series. I like them as supporting characters in the Marvel Universe. 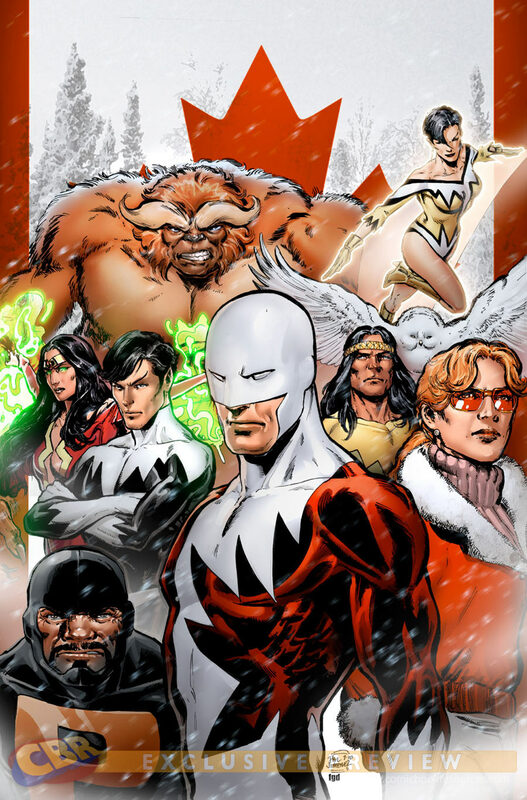 If the Avengers or Fantastic Four go to Canada for some reason, let’s have Alpha Flight appear. Need someone to deal with the Hulk? Sasquatch is the man for the job. But I just don’t see the majority of comics readers as chomping at the bit for the Canadian version of the Avengers. Their deaths in New Avengers were a complete waste, though; so, I am glad that they’re coming back to the land of the living for this Chaos War stuff. I still don’t understand why Alpha Flight had to die in order for Bendis to undo Morrison’s X-Men run. That’s like 2 + 2 = Grape Soda. Not just a rumor any more! This snuck onto CBR earlier in the week and hasn’t gotten the attention it deserves. It’s not an ongoing, and it doesn’t have art by Jiminez, but it IS Alpha Flight, written by Jim McCann. Thanks Doug! Unfortunately something went wonky with that CBR link. I’m soooo jazzed about this! My thanks to Doug and Chocotaco for making my day! So PJ started life as a Perez imitator, now he does perfect John Byrne rip offs? I have zero respect for that man. So who would in a fight, Puck or the original JSA Atom? Both are midgets, right?